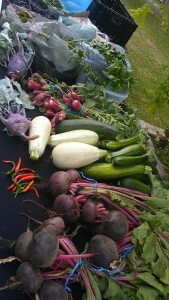 We supplement our local supply with organic produce from the Sydney markets, this comes in late Thursday afternoons. Green Connect sells a weekly Veg Box packed with local, seasonal and chemical-free food. It’s the delicious way to support food that is good for those who eat it, those who grow it and the planet. Green Connect is a social enterprise, a different kind of business, who employ former refugees and young people in jobs that make the planet better. With their veg box they grow jobs at their farm in Warrawong, and help build a fair, sustainable and resilient food system. As a Veg Box subscriber, each week you’ll get a range of different herbs and veg that change week-to-week. Before each season starts Green Connect will let you know what to expect (and let you exclude a couple of things you don’t want). Veg boxes are available in two sizes: regular (feeds 2-4) and small (feeds 1-2). To order, sign up online here, or just call Green Connect on 4243 1537 or emailfairfood@green-connect.com.au. Click here for access to the members part of the site.